Matter is made up of tiny particles called atoms. Atoms are further made of three fundamental particles or sub – atomic particles called electron, proton and neutron. Earlier Dalton postulated that atom is indivisible i.e. cannot be further divided which proved to be wrong by discovery of sub – atomic particles. Protons and neutrons are almost of same mass. The mass of proton is approximately 2000 times as that of the electron. These negatively charged particles were discovered by J. J. Thomson in 1897. In the experiment, a gas at low pressure was taken in a discharge tube made up of glass. At the ends of the discharge tube two electrodes were placed, connected to a battery for high voltage supply. The electrode connected to the negative end was known as cathode and that to the positive as anode. He then observed a stream of negatively charged particles coming out of cathode towards the anode. These particles were called electrons. The collection of negatively charged particles emitted from cathode of discharge tube is called cathode rays. Canal rays: The positively charged radiations produced in the discharge tube from anode are called Canal rays. These neutrally charged particles were discovered by James Chadwick in 1932. Neutrons are present in atoms of all elements except Hydrogen. Activity 1 - Comb rubbed with dry hair attracts paper pieces. Rub a comb on your dry hair. On rubbing some electrons will move from hair to comb. Thus the comb has negative charge. Now bring the comb close to some paper pieces. The negatively charged Comb will attract the paper pieces. Activity 2 - Glass rod rubbed with a silk cloth attracts an inflated balloon. Rub a silk cloth on a glass rod. On rubbing some electrons will move from glass rod to the silk cloth. Thus the glass rod becomes positively charged. Now bring the glass rod close to an inflated balloon. This charged glass rod now attracts the inflated balloon. It is also known as Thomson’s plum pudding model. In 1903 J. J. Thomson proposed the structure of an atom similar to that of a Christmas pudding. An atom is a positively charged sphere and the electrons are embedded in it. The Magnitude of positive and negative charge is same inside atom, so net charge inside an atom is zero. α - Particles are doubly charged helium ion. Since they have a mass of 4 u, the fast-moving α - particle have a considerable amount of energy. A thin gold foil with thickness of about 1000 atoms. 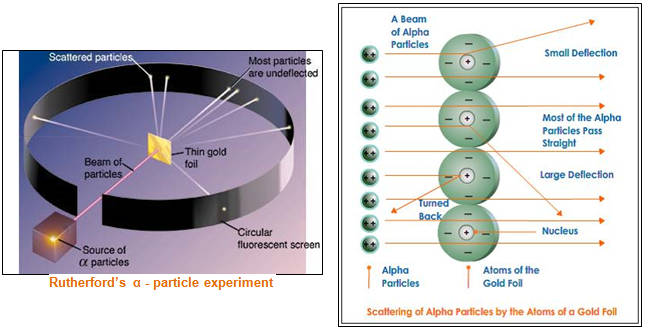 A lot of fast moving α - particles were bombarded on thin gold foil. After passing the foil the α – particles, hit the screen. Most of the space inside the atom is empty. At the Centre of an atom, a small, heavy, positively charged nucleus is present. Electrons revolve around the nucleus. Total positive charge in nucleus is same as total negative charge on all electrons of atom as atom has net zero charge. 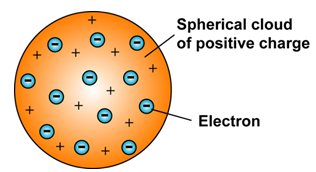 According to Rutherford model, electrons revolve around positive charged nucleus. According to the, Theory of Maxwell, if any charged particle does accelerated motion it must radiate energy. Therefore, if a charged body (e-) rotates around another charged body (nucleus), it will radiate energy. Due to energy loss through the radiations, speed of electrons will decrease and eventually it will fall into the nucleus. But such collapse does not occur and atoms were found to be quite stable. Rutherford after this experiment gets the credit of discovery of nucleus. The protons and neutron, collectively known as ‘Nucleons’ were present in the nucleus. It was found that almost all mass of an atom resides in nucleus. 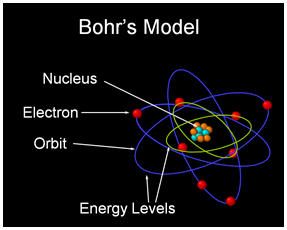 In 1913, Neil Bohr overcame the limitations of Rutherford model and proposed a model of atomic structure. Electrons revolve around a centrally located heavy small and positively charged nucleus in certain discrete orbits. While revolving in discrete orbits the electrons do not radiate energy. The number of protons present in the nucleus of an atom is called atomic number. It is denoted by Z. For example, in aluminium atom number of electrons is equal to atomic number but in aluminium ion it is not so. Mass number is equal to the number of nucleons present inside the nucleus of an atom. It means it is the sum of number of protons and neutrons present in the nucleus of an atom. It is denoted by letter A.
Nitrogen is written as , where 14 is the mass number and 7 is the atomic number. Isotopes are atoms of same element having same number of protons but different number of neutrons. Isotopes have similar chemical properties but different physical properties. 1. An Isotope of uranium is used in nuclear power plants to generate electricity. An Isotope of cobalt is used in the treatment of cancer. An isotope of iodine is used in the treatment of goiter. Fractional Mass number of elements: If an element is a mixture of isotopes, it may have fractional mass number. For example, chlorine exists in two different isotopic forms i.e. and in the ratio of 3 : 1 i.e. 75 % and 25 %. The varying mass numbers are 35 and 37 respectively. For calculating Mass number of chlorine, percentage of the isotopic form is used to calculate the average mass. Isobars are atoms having different number of protons but same number of nucleons (number of protons + number of electrons). For example, Argon and Calcium have different atomic number but same mass number. The distribution of electrons into different orbits of an atom was suggested by Bohr and Bury and is known as electronic configuration. 2. Orbit are filled from inside to outside. First, n = 1 shell is filled, then n = 2, and so on. 3. The outermost occupied shell of an atom can have a maximum of 8 electrons even if it can accommodate more electrons. 1. Sulphur - It has 16 electrons. Therefore the electronic configuration is 2, 8, 6. 2. Sodium - It has 11 electrons. Therefore the electronic configuration is 2, 8, 1. 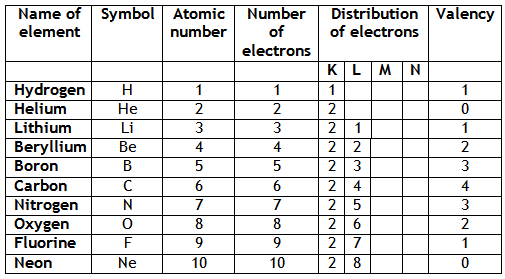 Valency of an element is the number of electrons that its atoms should give away or take to attain stable electronic configuration i.e. the atom should accommodate 8 electrons in the outermost shells or valence shells except the K shell which can accommodate 2 electrons to the maximum. The electrons present in the outermost orbit of an atom are known as valence electrons. Hydrogen molecule: Hydrogen has only one electron in its outermost orbit thus requires one more electron to complete its outermost orbit (K shell). For this, hydrogen atom shares one electron with another Hydrogen atom and forms H2 (Hydrogen molecule). Note - Atoms do chemical reactions to attain stable configuration. But noble gases are inert as they already have stable electronic configuration. 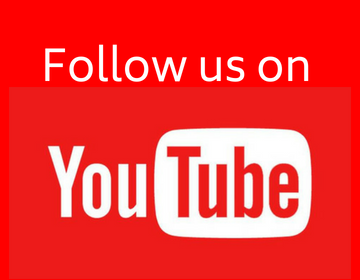 Very nice but how to learn full I can't open full video why? This is the best ever website I ever saw for my notes..things are so very well-written and easy to understand.These notes are really helpful and informative...The notes of dronstudy for bio-diversity are also great..they made it so easy to understand such a diverse chapter..I recommend this site to all my friends...KEEP IT UP! !